Is it possible to speed up PdaNet? Discussion in 'Android General Discussions' started by Fridsade, Aug 10, 2011. My phone (Moto Droid :motdroidvert is constantly 3G with 4 bars and I have unlimmited data plan, but it's still slightly slow. I'm on USB tethering. It would take about 7-13 seconds to load a page and sometimes even longer, all I want to do is surf the internet and get on YouTube. Is it possible to speed it up? 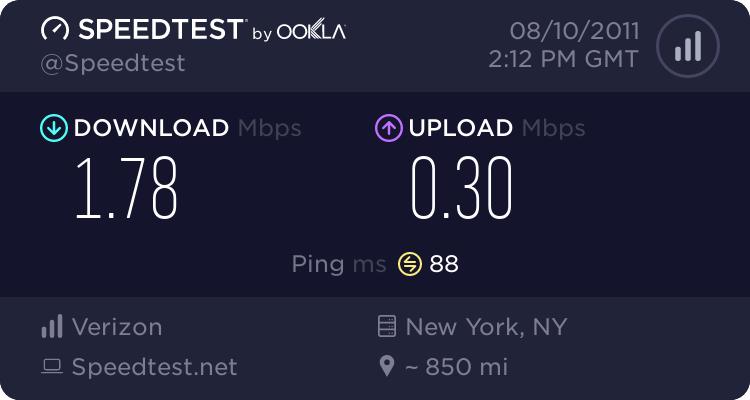 Of course I'm not asking for it to be super fast and this is what I got when I did a speed test. That's average 3G speeds. You aren't going to get faster that what 3G provides.